Had Justice Laxmikanta Mohapatra not acted a conduit for chit fund operator Pradeep Kumar Sethy, he could never have acquired a ‘B’ category plot measuring 4000 sq.ft. in the most lucrative Bidanasi Housing Project area of Markata Nagar of Cuttack and by way of its transfer, would never have formed the triangle with the State’s Advocate General Asoka Mohanty. RTI activist Jayanta Das deserves all praise for having dug out information that are to be dealt with here. The information is available in social media, as he and Alok Jena have shared them with the society. I was expecting Justice Mohapatra to react. He is silent. Advocate General Mohanty could have also come out with his clarification. He has not. Padeep Sethy has been arrested and facing trial for cheating the chit fund depositors. With him entangled in this plot scandal are Justice Mohapatra, then of Orissa High Court on one side and Orissa’s Advocate General Asoka Mohanty on the other! This triangular scandal has another side also. We are conducting an enquiry thereon and will deal with the same after our investigation is over. But it is time to say, to us it seems, Justice Mohapatra has acted a conduit for the chit fund mafia Pradeep Sethy. It seems Justice Mohapatra has acted from the beginning to arrange the plot for the economic offender. He had no real necessity for the residential plot in Markata Nagar of Cuttack City. This is evidenced in his later declaration that, being a permanent resident of Cuttack City, neither he nor any of his family would ever need a residential plot in any of the housing projects of CDA. So, evidently there was no urgency for him to use official letterhead of the High Court to apply for the plot under discretionary quota which is ethically meant for helping people who are in very urgent need of a residential plot, but quick allotment of the required land to them is not possible in the normal process. The urgency for the allocation expressed in his application is obviously not for his use, but for circumventing the allocation process for a shadow beneficiary who subsequently transpired to be a chit fund cheat. Let us see why this occurs to us. The ‘B’ category plot could not have normally come to Sethy. Not even to Laxmikanta Mohapatra as an Individual in normal allocation process. So Mohapatra used the official letterhead of the Orissa High Court to browbeat the authorities and acquired the plot by way of allocation from the discretionary quota of the Chairman of Cuttack Development Authority. To bag the plot, he hoodwinked the law by crafty suppression of the fact that he has already had his residential house in the city of Cuttack. He is a permanent resident of Stoney Road, Chandini Chowk, Cuttack. 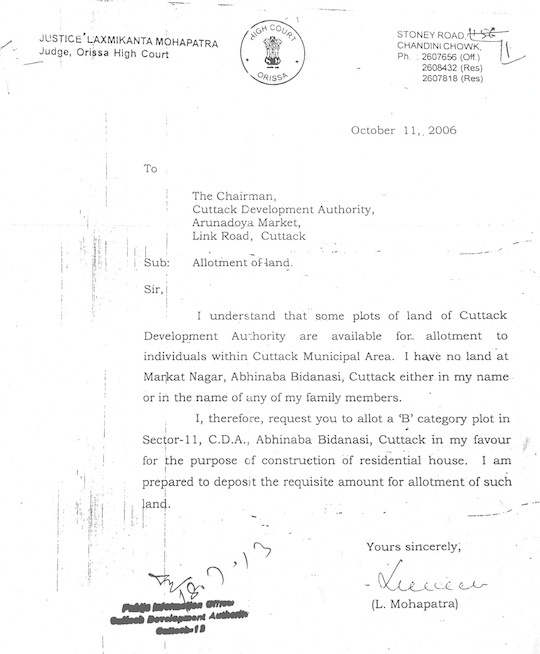 The law says, a resident of the City cannot be allotted with a residential plot from the CDA in the city of Cuttack. Therefore, suppressing that he has permanent house in the Cuttack City, he stated in his application dated October 11, 2006. “I have no land at Markata Nagar, Abhinaba Bidanasi, Cuttack either in my name or in the name of any of my family members”, as if Markata Nagar is a different place and not a part of the City of Cuttack. CDA also helped him in this mischief in the body of allocation. The use of the High Court letterhead and his position as Judge of the Orissa High Court was too intimidating for the CDA staff to examine the legality and ethicality and eligibility aspects in allocation of the land to him. And, consequently, Plot No. 11-38/1332 measuring 4000 sq.ft. in ‘B’ category was given to him for only Rs.9,50,500/- under order No. 12699 of CDA on 25.5.2007. Mohapatra took over possession of the plot on 23,07.07. But did not bother about execution of the lease deed. Had the deed been executed, he would have been required to pay to the exchequer in form of Stamps. Non-execution of the lease deed for several years after allocation of the land to and taking over of the land by Justice Mohapatra was deliberate, because, a design was already on the anvil to transfer the plot to Sethy with a huge profit margin by way of commercial use of the plot, though the allocation was strictly for residential use of Justice Mohapatra. Mahapatra had no right to use the plot in commercial transaction. Firstly, being a judge, he should not have sought for personal benefit at the discretion of the CDA chairman, which was de facto bound to make him obliged to the boss of a commercial institute that deals with allocation of plots and contracts of developmental works necessitating judicial intervention as and when occasion arises. Secondly, had he wanted not to continue with the allotted plot, he should have surrendered the same to the CDA before making any value addition thereto. He did not do. He had a design to make a commercial profit out of it. He has made the commercial transaction behind back of the CDA before the lease deed was executed and has nose led it to put stamp of approval on his commercial deal. I quote from his affidavit where he has informed the CDA in these words: “I have entered into negotiation with Sri Pradeep Kumar Sethy S/o Rama Chandra Sethy, resident of Ananta Nagar, 6th lane, Berhampur -760005, Dist. Ganjam, Orissa for transfer of the above plot because of my legal necessity and I have received the consideration money amounting to Rs.1,00.00.000/- (Rupees One Crore only) as agreed between us”. Mark the mischief. He has not made this negotiation with the chit fund mafia Pradeep Sethy with permission of the CDA. He has simply declared that he has entered into negotiation with Sethy to transfer the plot to him by already having received Rs.1 crore as consideration money and has asked the CDA to transfer the said plot to Sethy, as by then the lease deed was not executed. As the lease deed was not executed, he was not to make the registration. The transfer was not to be done in the land registration office of Government of Orissa, but was to be done in the file only in the office of the CDA. So, despite the land transfer made against consideration money amounting to a crore of rupees, the same being done out of the Registration office, the stamps applicable to a Rs.1 crore worth land transaction was not to come to the exchequer. In order not to give any scope to CDA to allot the plot to any other person than Sethy, Mohapatra stated, “I have not negotiated with any other person for transfer of the plot” and undertook “to hand over possession of the land to Pradeep Kumar Sethy after obtaining permission for transfer of the ownership allotment and before execution of the lease deed in favor of the prospective transferee”. On receiving this affidavit, CDA “transferred” the plot from Justice Mohapatra to Pradeep Sethy under order No. 8098 dt.23.4.2011 “to be used only for residential purpose” with the stipulation that “the residential building must be constructed within one year from the date of issue of this letter”. This stipulation indicates that no “residential building” was standing on the plot by that date, which prompts us to infer that Justice Mhapatra had lied in the affidavit about standing of a two-storied building in the plot just to add about (90 lakh of rupees worth value to the plot procured by paying the CDA a sum of Rs.9,80,500/- only. Had the double-storied residential building been really there, CDA could not have subjected the transfer of the plot from Mohapatra’s name to Sethy’s name to a non-violable condition that the “residential building must be constructed within one year from the date of issue of the land transfer letter. Mohapatra being a Judge, that too a Chief Justice of a High Court now, it is expected that he should clarify the position for removal of shrouds of suspicion over the issue. Sethy took possession of the plot on the same day, i.e. 23.4.2011 and without getting the lease deed executed, and violating the condition for residential use of the plot, entered into a negotiation with Advocate General Mohanty to transfer the plot to his name on receipt of Rs.1,00,01,000/- towards consideration money. Thus, two major transactions worth more than Rs.2 crores was carried out on the same plot twice behind back of the Registration Office, Had the lease deeds been executed promptly after allocation of the land by the CDA, the transfer, instead of the concerned file in the office of the CDA, must have been done in the Land Registrar’s office and huge amounts of revenue in shape of stamps could have come to the State Exchequer then and there. Yet again, it transpires from the communication of CDA to Asoka Mohanty bearing No.6953 dated 22.3.13 that there was no residential building on the plot, for which Mohanty was subjected to the terms and condition that he was to construct the “Residential Building” on the plot as a “must” “within one year from the date of issue of this letter”, failing which, “the lease would be determined and allotment will be cancelled and the possession of the plot would be taken over by the Authority”. So, here also, evidently the land was transferred to Mohanty without subjecting the said transfer to necessary stamps. However, Sethy has stated in his affidavit that he was making the transaction with Mohanty “because of personal necessity”. But Justice Mohapatra had made the transaction with Sethy not for personal necessity, but for “Legal necessity”. What was the “Legal Necessity” of Justice Mohapatra to negotiate with Sethy for transfer of the allocation from his name to Sethy’s name in the file of the CDA? Unless Justice Mohapatra comes out with details of why it was a “legal necessity” for him to transfer his plot to Pradeep Sethy, it may be difficult to discard the suspicion that he has acted a conduit for the chit fund mafia in the instant case. This angle is is difficult to be discarded in view of the fact that he had not responded to any advertisement of CDA for the plot, but had applied in the High Court pad as it was understood by him that some plots of CDA were available for allotment. Mark the media added above. There he says, “I understand that some plots of land of Cuttack Development Authority are available within Cuttack Municipal area. I have no land Markata Nagar, Abhinav Bidanasi, cuttack……”. The question is, who made him understand this? When the availability of the plot was not advertised, how could he came to know of it? From the developments discussed above, we are inclined to suspect that Sethy had obtained the information and had made Justice Mahapatra apply for the same with yet unknown compulsions, which had forced to hand him over the plot under “legal necessity”. This suspicion cannot end till he gives details of the “legal necessity” and convinces the public that in this scandal, he is innocent. A sitting Chief Justice of a High Court and an Advocate General of a State Government forming the triangle with a chit fund mafia over the plot in question, an enquiry by the Supreme Court of India into this scandal seems essential to cleanse the judicial system of misusers of their privileged positions. And, the sooner it is done, the better. Hon’ble Apex Court of India needs to interfere in this matter. Every morning I look for a cup of RED TEA , most of the days my wife obliges me. Similarly -n- definitely these people of the article must be starting the day every morning with a cup/pouch of human RED BLOOD …….. So, what makes you think the Hon’ble Supreme Court will play BALL as you WISH. Are they, Mr. M and M, not very much a part of the same fraternity. All knowing and experts of cutting corners to fit in to different holes of law, may be difficult to be handled individually. However a day will be here when the remedy will come automatically when each house will produce a revolutionary against people /ideology who suppress the so called weaker section for they have guarded the land, water, and the Jungles for ages for benefit of the whole human community.